To locate the sample projects included with your installed software, open the "Help" menu and choose "Samples". The samples window shows the categories, sub categories, and project files. In addition to the projects shown, there are files, for use with these projects, in the same directories. Descriptions of the projects and files are found in Step by Step and in Samples and Walkthroughs. You can click on any project listed in the window to load it into TextConverter. All user interface elements have a small Help button ( ), which will show the help topic for the current context. Pressing the F1 key on the keyboard will yield the same result. Most of the user interface elements have associated tool tips. A tool tip will appear if the cursor is fixed over a UI element for more than a second. 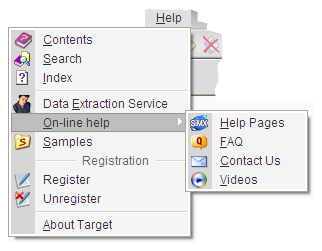 Both links are available through components' "Help" menus (See the picture above).